We offer a safe and respectful environment with clean modern facilities. While camping with us, you can use the thermal hot mineral pools at no extra charge. Welcome to our Camp Ground! When you are looking for affordable accommodation in Tauranga in quiet surroundings, a nice and safe place to stay with the family, or if you’d just like to relax and get away from the city for a while, just contact us for more information or to book your stay. There are plenty of great activities and attractions in the area, including some of the best walking and biking tracks in Tauranga. The Welcome Bay shops are also within easy walk. 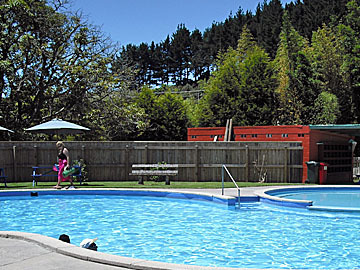 The Welcome Bay Hot Pools and Campground is a family owned and operated swimming pool complex and camping ground situated on the outskirts of Tauranga, close to Papamoa and Mount Maunganui in the beautiful Bay of Plenty, one of New Zealand’s favourite holiday destinations. Your hosts Fraser Berkett and Chris Mackay have been happily running Welcome Bay Hot Pools and Campground for several years now, and they live on-site with their family. They take pride in offering guests a friendly family atmosphere and they always go the extra mile to provide a safe and comfortable environment. It’s important to them that all guests can enjoy a quiet and relaxing stay, and they make sure the modern facilities on the premises are maintained to the highest standards at all times. 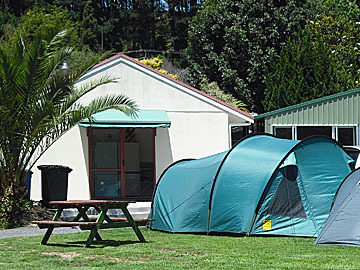 The Welcome Bay Hot Pools and Campground are set in a peaceful natural environment, where the sounds of native birds abound. Staying at this lovely boutique campground and soaking in the tepid natural mineral pools means tranquillity and being at harmony with nature. We are only 15 minutes away from the popular Mount Maunganui main beach. Papamoa can be reached in 10 minutes and has an excellent shopping centre, Palm Beach Plaza. 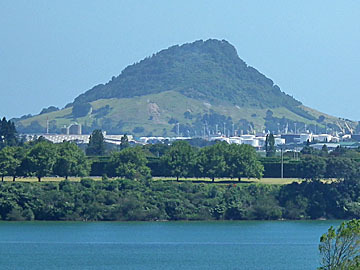 Enjoy some of the best walking and biking tracks in Tauranga.